I couldn’t be happier with this upper! At this price I think it’s a steal. It feels very comparable to the BCM uppers in this configuration and for 1/2 price. I will be ordering another one for sure. Overall, the upper seems to be put together well. It matched up sweet to my lower build. I’m waiting on a couple more things before I can do a full function test. My only complaint thus far is the left side of the receiver has some superficial pitting/scuffing, and there are two very fine lines or maybe scratches running the length of the receiver on the left side. Maybe forge marks? There is also a very small nick in the top rail, left hand side. (T21). Again, superficial… (very small), but aggervating none the less. Customer service, has been great thus far. There was a problem with getting the Hera rails in from Germany on my original order. CBC changed it to their gen 2 rail (after my approval), and shipped it out asap. No complaints with the company… only minor with the product. My previous review was complete and brutally honest, but don’t it scare you away. The issues as previously stated weren’t enough to make me want to return it. (Superficial) I now have several rounds down range with no issues at all. Bottom line, this upper is solid. A great way to top off a build. I’ll use CBC for my next build. Thank you for this product! Beautifully manufactured! Love everything about it, customer service is on point as well! I was hard pressed to believe that people said that it was in the same quality range as BCM, but they weren’t joking! Well Done!! Next up, the function test!! More to come! I ordered this upper when they had the sale that included the BCG and Charging Handle. My only complaint was it took way longer to ship than was originally stated. Spoke with Chris at CBC and he got my order going. With that being said, I received and outstanding product. 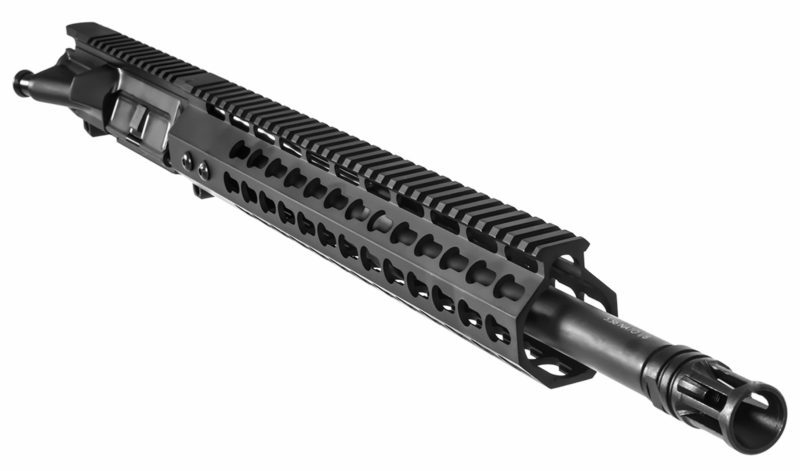 The upper was shipped like it was a part of Fort Knox! Thanks CBC! Have run about a 100 rounds through it with no problem. Will definitely buy again. Especially since I am now building a 300ac blackout. For my first ar build I searched and searched for a quality upper. After reading probably 1000 reviews on uppers I decided to give CBC Industries a try. Best idea I’ve ever made. The upper was packaged well and arrived on time. Also a tight fit when paired with a spikes tactical lower. No rattle what so ever. The only complaint is a few tool marks on the gas block but not noticable unless you point it out. Finish and alignment was flawless. Enough about the looks. How does it stack up against other ar’s? I compared this upper with a Core complete rifle ($1000 and a heavy barrel) and at 75 yards both rifles performed nearly the same, 30 rounds in 2.5 inch grouping. Here’s the difference, the CBC upper had a red dot 1x scope versus the Core with a 3-9x rifle scope. If you’re on the fence about what upper to buy…. Look no further. Add it to the cart and buy it now. These uppers are excellent. Not to mention they employee military veterans. Excellent price and a quality upper. Also, their gen2 keymod looks pretty sweet as well. What are you waiting for…. Buy one.